Judy Graves is a longtime charity advocate and Vancouver city staffer. In the 2010s Graves worked for Vision Vancouver’s city council as “Advocate for the Homeless,” where she was hired both to promote the city’s housing policies and to liaise with homeless residents of the Downtown Eastside. 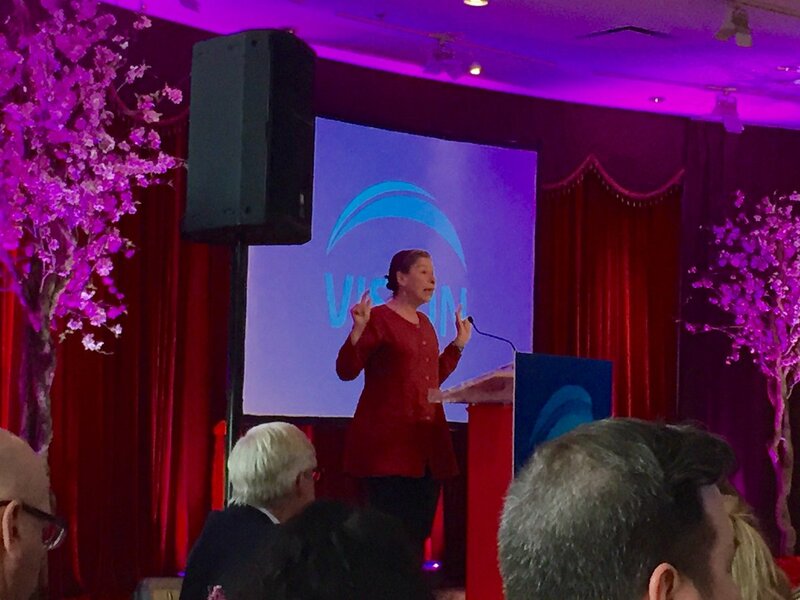 On the coattails of that position, she campaigned with Vision and Gregor Robertson in the 2014 election. This time around Graves is running with OneCity, a party created in 2014 shortly after the left-wing COPE party split from its electoral alliance with Vision Vancouver. Currently, OneCity’s leadership is made up of former COPE members who at the time supported a Vision alliance. Judy Graves’ candidacy seems to reflect OneCity’s policy of silent support for the governing party and non-criticism of Vision policies, and longtime Vision luminaries have likewise supported the Graves campaign. More important is the vital political distinction between the two candidates. Whereas Swanson has directly challenged the common sense tax-cutting agenda, Graves combines a charity approach and a “class collaboration” approach that has been popular with developers and the wealthy. Here is our perspective on the Judy Graves campaign. In establishment circles, Judy Graves has long been seen as the “Mother Teresa” of Vancouver. A brief flip through the pages of Business in Vancouver or Vancouver Magazine reveals an outpouring of praise for her work, and those in the business sector have long been drawn to her philosophy of tackling homelessness through philanthropy and individual acts of humanitarianism. In her paid role working for the City, Graves has been known for paying personal attention to those in need, and working on a case-by-case basis to find housing for people. But in Vancouver and B.C.’s climate of austerity and neoliberal economics, this has most often involved fitting a round peg into a square hole, placing people into non-existent or substandard housing (all levels of government have resolutely abandoned the principle of building non-market housing). More often than not the “Graves model” has involved bumping hand-picked individuals to the front of the B.C. Housing waitlist while ignoring the urgent need to shrink the waitlist, or to address the underlying causes of homelessness itself. This is highlighted by the numerous occasions on which Graves has been called in to help the City mute out community organizing and bring an end to squats and tent cities, which are crucial spaces of survival and collective resistance. Over the decades she has been widely seen as an establishment figure who has worked to individualize the fight for housing, and deny the larger forces that create homelessness and evictions on unceded Coast Salish territories. Phrases such as “hard to house,” and related concepts that pin homelessness on homeless individuals – including the dominant framing of mental health and addictions – are indelibly associated with the Graves name and legacy. Unsurprisingly, the Establishment has flocked to the “Graves model” of philanthropy and developer-funded partnerships like Street To Home. Property owners and the corporate media have continued to respond positively to Graves. As she put it recently during her campaign, “the city needs class collaboration, not class war.” In turn Graves has supported developer initiatives, including the Boffo market housing tower on Commercial Drive. The project is located on the current site of the Kettle Society, and a private deal has been struck with the non-profit to preserve their services while allowing for the high-value market redevelopment. But the deal is not the “win-win” that class collaboration implies, because gentrification on Commercial Drive will put increased market pressure on a valuable and dwindling affordable housing stock in East Van. Since that time, Graves has been a mainstay on the side of government efforts to close down shelters and disperse tent cities. Graves played a continuous role in the City’s yearly spring closure of homeless shelters in the early to mid-2010s, standing by the intolerable evictions while “relocating” people into substandard, unsafe, or non-existent housing. 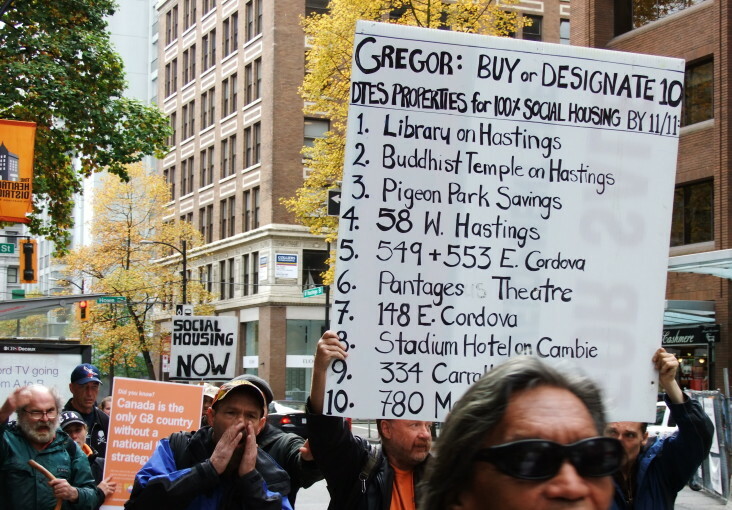 Housing activists like Rider Cooey routinely pushed her and other staffers to speak out against such evictions, but Graves instead bolstered the Vision line. Despite Vision Vancouver’s half-decade of harmful pro-market housing policies and anti-homeless by-laws, Graves stood by the party in the 2014 elections. That year, she campaigned with Vision Vancouver and supported Mayor Gregor Robertson, and up to the present Graves has continued to stay silent on Vision’s harmful policies. Instead of criticizing those policies during her current by-election campaign, she has made vague comments about Vision’s lack of gusto; instead of challenging the City and local elites head-on, she has instead resorted to a strategy of blaming “newcomers” for the housing crisis. Graves’ campaign, in a Trumpian turn of phrase, is about “bringing back the Dream of Vancouver.” But we have to ask, which Vancouver is Graves summoning? Is her “Dream of Vancouver” really just a settler colonial fantasy? The homeownership model worked for Graves’ family, and for post-war white working and middle class families more generally. But did it work for Indigenous and propertyless working class communities then, and can it possibly be revivified now? This is not the first time Graves has leaned on xenophobic themes. A scroll through Graves’ social media over the past few months reveals a flurry of anti-foreigner sentiments. Graves has liked posts such as “foreigners should not be able to buy [real estate] until they have lived here for ten years,” and “why do we need all these luxury condos for Chinese billionaires? We don’t.” The latter comment was by B.K. 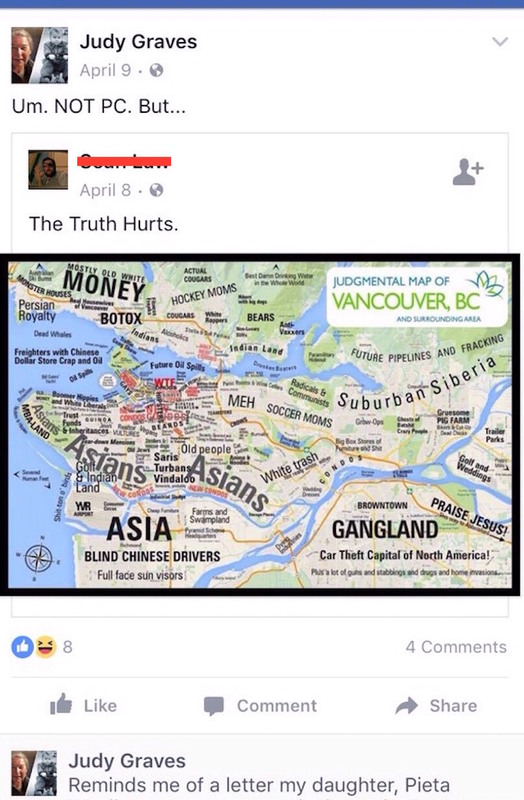 Anderson, Education Coordinator for the Vancouver School Board. Anderson was replying to a post that had nothing to do with Chinese billionaires, but was about the housing crisis. 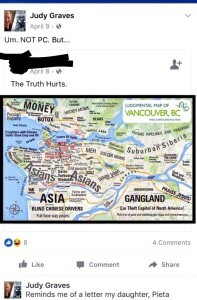 Graves also approvingly shared a “not PC” map of Metro Vancouver, with “Asians” scrawled across it and caricatures of Richmond, Surrey and other suburbs. We don’t feel that Judy Graves represents the kind of transformative politics we need. The current housing crisis provides an opportunity to radically rethink the foundations of the system, but instead Graves wants to bring back the dream of that very system. By scapegoating foreigners and Chinese investors, instead of the system of settler speculation and dispossession itself, Graves is yet again pushing for the status quo. It’s time for something radically different. Posted in City Hall, Downtown Eastside, Uncategorized. Bookmark the permalink. 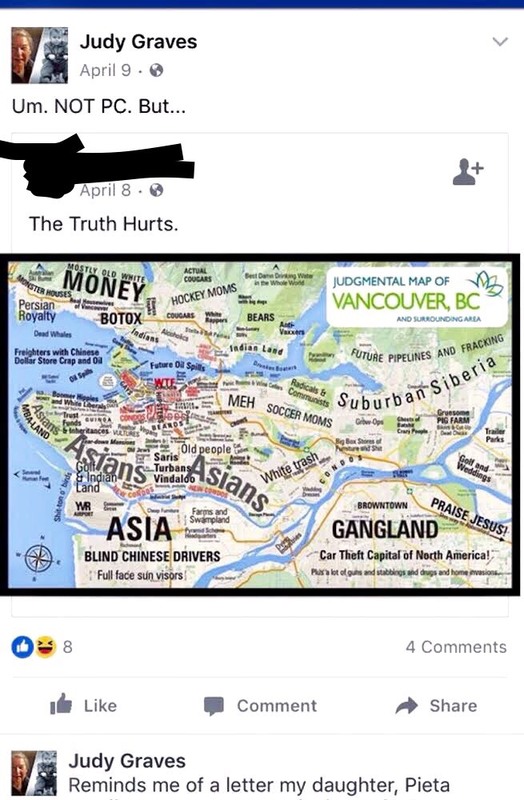 Vancouver housing and resources can NOT be an all you can eat smorgasbord for the chinese and also provide affordable housing to Canadians. Pick one or the other and there is nothing xenophobic about that. What is xenophobic about that is inevitably the result of refusing to address systemic problems which only leaves naming a group that is currently dominating in this aspect of the system. Forget the “chinese” and address the systemic origins of the problem is you want to avoid xenophobic conclusions. Independents did poorly, including (in relative, name-recognition terms) Swanson. Main reason is that voters recognize that any governance, but particularly at the local level, takes compromise & collaboration. In other words, you win some, you lose some, but you keep respectful relations and move forward. You build a network that crosses belief boundaries. Swanson has little of that. Her activities are fueled by radicalization, anger, entitlement and occasionally revenge, which gives her a limited, but dedicated constituency. Behaviour like that ultimately creates intense political backlash (e.g. the near extinction of BC NDP in 2001).